Since we only use the egg yolks for the ice cream, we’ve been looking at ways of using left-over egg whites. 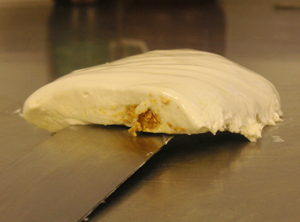 Cian, one of our Dingle shop team suggested nougat, so I’ve been working on a recipe and techniques to see if we could come up with something tasty. Called “torrone” in Italy and “turron” in Spain, this dessert is most likely of Arab origin although some people claim it came from Crete. However, given the almonds and honey in it, I would say that it has Arabian roots. In any case, I’ve been playing with different recipes over the last couple of days, and I have some edible rice paper ordered, which should make it look more professional. I’ll post the recipe as soon as I have it figured out, but in the mean time, these trial runs are going into some really tasty ice cream for the shops! We’ve had the sailors from the yacht race La Solitaire Affelou Le Figaro in town for the last few days, and they sailed back toward France today on their final leg. 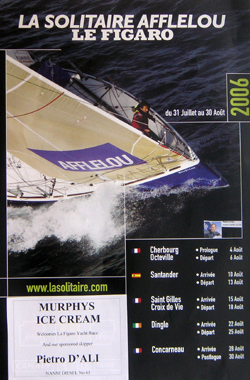 La Figaro is a gruelling solo race that’s as much endurance test as anything else. The sailors have identical boats and just themselves to get them through each multi-day leg. To get an update on how Pietro and the other sailors are doing, check out the race’s stunning website that has gps positions tied to a map and the actual routes of all the boats. 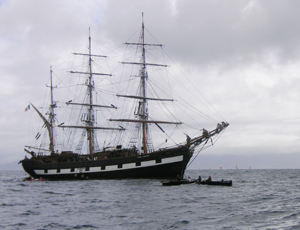 The Jeannie Johnston was in the mouth of Dingle harbour today to help them on their way along with Fungie and a few local naomhogs, but now it’s up to the sailors to make it safely back to France in the fastest possible time. 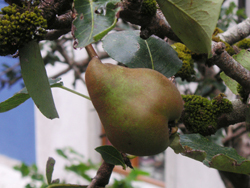 Another dessert invented by Escoffier, also with a musical theme, is Pear Helene (Poire Belle Helene). The inspiration came from the 1864 operetta of the same name, by Offenbach. A favourite dessert in our family, it’s simple and delicious. 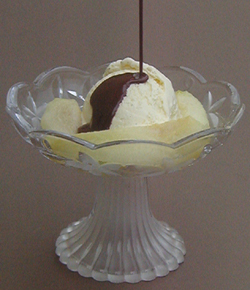 All it takes is some poached pears (you can use canned ones to make it dead easy, although I wouldn’t during the summer season), vanilla ice cream, and warmed chocolate sauce. That’s it. It’s a treat I remember from my childhood (and I can thank my parents for lavishing such things on us as youngsters – resulting, perhaps, in my chronic sweet tooth). I haven’t had it for ages, but leaving my parents house a few days ago, I noticed that their pear tree was full of pears, and that was enough for me to go poaching. I used a sugar syrup (a ratio of about 1:10 – sugar to water), and only poached them enough to soften them slightly (aboutÂ 5 minutes). There’s little assembly required – a bit of ice cream, some warm chocolate sauce liberally dribbled on top, and the spoon is ready for work. 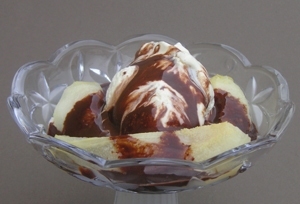 I have seen this dessert presented as whole poached pears resting on a lake of chocolate with the ice cream adjoining them, and that has quite a dramatic effect! At the suggestion of one of our good customers, I played around a bit with Peach Melba over the weekend in the odd hours I had out of the shop. 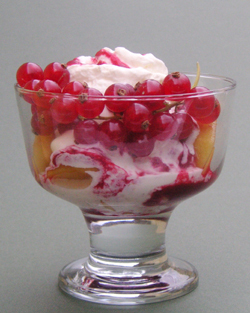 Invented in the 1890s by the French chef Escoffier, who was working at the Savoy in London, Peach Melba was a dish made for an Australian opera diva – Nellie Melba. It consists of poached peaches, vanilla ice cream, and a sauce made from raspberries and redcurrants, although it’s usually just made with raspberry sauce. I don’t know if it will make an appearance in our shops, as I would be loath to use canned peaches, and it would be hard to keep poached peaches around the place. 1. Peel and cut up some fresh, ripe peaches (allow a full peach per person), drop them into boiling water with a few tablespoons of sugar and leave for two or threeÂ minutes (I don’t like to give them an over-cooked taste). Strain and allow to cool. 3. 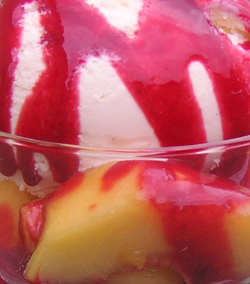 Put the peaches in a dish, add a scoop of vanilla ice cream, and drizzle liberally with the raspberry sauce. 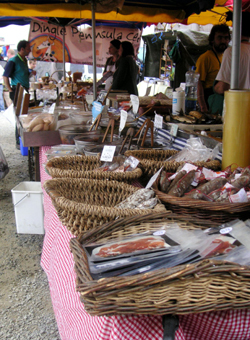 Dingle has hardly been left out of the growing boom in farmer’s markets, and the Friday market is definitely worth a look and nibble for anyone in town on that day. Set on a vacant lot, between the back of Garvey’s Supervalue and O’Flaherty’s Pub, it houses around twenty stalls. 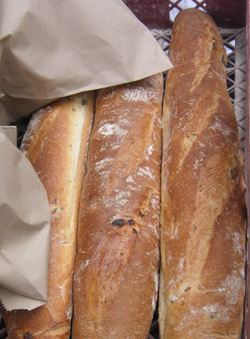 With offerings from Maja’s Dingle Peninsula Cheeses and Olivier Beaujouan’s seafood products to vegetables, meats, bread and baked goods, it’s definitely a place to stock up for a picnic lunch. There are also some craft stalls including Britta’s excellent woolen jumpers. The market has definitely been gaining in popularity over the past year or so, and yesterday there was a big crowd of customers. 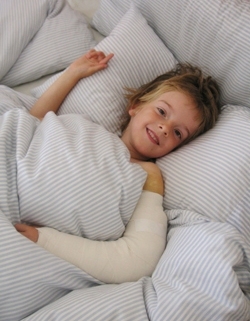 On top of everything converging on this busy time in the world of ice cream, Conor, my brother’s son, suffered a compound fracture of the arm, just above the elbow. He jumped over a rose bush, landed on a soccer ball, and met the waiting concrete below. The poor fellow spent the night in traction, had an operation in the morning, but is now recovering well. We’ve been feeding him ice cream. It’s great medicine! Being an incorrigable chocoholic, it’s hard for me to ever admit that there is such a thing as too much chocolate (especially since one of my favourite things that we serve in the shop is the Warning! Dangerous Chocolate – shown above). 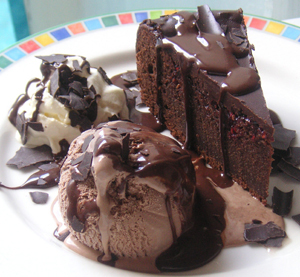 It’s chocolate cake, chocolate ice cream, chocolate sauce, chocolate shavings and a bit of cream drowned in chocolate. However, last night I ate at a very respected restaurant in South Kerry, and while the meal was fabulous, the dessert definitely left me wanting. It was a bitter chocolate tart with hazelnut ice cream. Now I’m a big fan of bitter chocolate tarts (see here), but I think there is a general misconception about chocolate – that darker is always better. In other words, an 85% cocoa-content chocolate will be better than a 50%. However, it doesn’t really work that way. Most dark tasting chocolate is around 70%, and that’s because once you go beyond that, the flavour of the chocolate recedes, and you are left with just the bitterness. 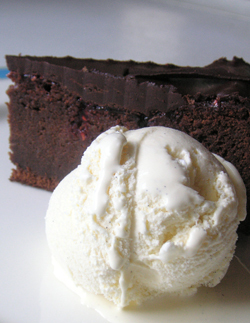 I would always serve very dark chocolate cake with cream or vanilla ice cream or raspberry sorbet, etc., just to balance the bitterness and to bring out the flavour. Either something creamy or something fresh on the palate. In the case of the dessert in question, the hazelnut ice cream was far too dense (it actually fell apart on the plate) and not creamy at all. I was just left with the bitterness of the chocolate with the addition of a nutty flavour but without any balance. 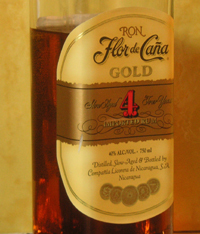 My brother-in-law Paul brought me a bottle of rum back from Nicaragua, where he was touring with an orchestra, playing his horn. 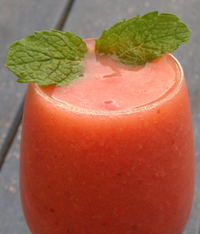 So I made some of it into a frozen strawberry banana daiquiri. It’s one of the big secrets of having a domestic ice cream freezer – you can make great frozen drinks that are sure to be a smash hit at parties (although there wont be enough for more than a few guests). The only caveat is that there needs to enough non-alcohol content to make it semi-solid. 1. 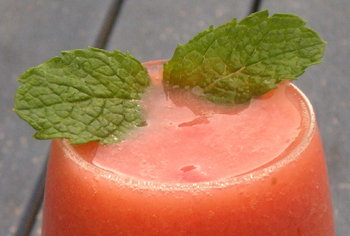 Combine all of the ingredients except the rum and puree using a blender or food processor. 2. Transfer to a sauce pan and bring to a boil over medium heat, stirring constantly. 5. Transfer to a domestic ice cream freezer and run it until the daiquiri thickens. It will take much longer than a normal ice cream mix, and it wont freeze as solid.